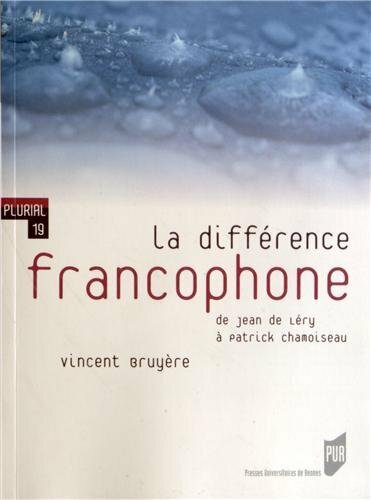 My first book, La différence francophone, de Jean Léry à Patrick Chamoiseau (Presses de l’Université de Rennes, 2012), examines the impact of transnational and postcolonial methodologies on the cultural project embodied by French literary history. The objective is to reassess the scope and potentials of Francophone studies, by arguing that the idea of “Francophone difference,” understood to designate literary texts produced in French outside France, should encompass a wider range of critical discourses and creative practices that question literary modes of engagement with issues of cultural identity. The book raised important questions regarding what it means to do research in literary studies and what it means to picture Francophone studies as the future of French literary history. Each chapter focuses on a site of transmission, resistance, and transformation: the concept of historiography in the work of French historian Michel de Certeau and postcolonial thinkers (chapter 1), a sixteenth century Calvinist travelogue turned into a proto-ethnographic document (chapter 2 and 3), the writing of history in contemporary Francophone Caribbean fiction (chapter 4), and a West-African film memoir dealing with trauma and memory (chapter 5). 2015 “Études littéraires et écologie du minoritaire.” Francophonies d’Amérique 36 (2013): 97-111.